Copperfish Books is pleased to announce a very special event with New York Times bestselling author Mary Kay Andrews on Wednesday, May 8th. Mary Kay – the empress of the beach read – will speak at a lunch at F. M. Don’s in Punta Gorda, one block from Copperfish Books. The event begins at 12 noon. Mary Kay’s latest novel, SUNSET BEACH, will be published by St. Martin's Press the day before, on May 7th, and she will be happy to sign copies of her books. The price to attend is $45, which includes a copy of SUNSET BEACH (in hardcover), a salad entrée, dessert, and a non-alcoholic beverage. Guests may also purchase drinks from the bar. Drue Campbell's life and career have recently been derailed. The only thing she has left is the house her mother left her: a ramshackle beach bungalow with a missing roof in the once-sleepy town of Sunset Beach, which is rapidly becoming a hot spot for the rich and well-heeled, who are none too pleased about the shabby eyesore in their perfect neighborhood. When Drue's larger-than-life father unexpectedly turns up at her mother's funeral and offers her a job at his law firm, Drue doesn't know whether to be grateful or resentful that he has suddenly reappeared. She grudgingly accepts the job sifting through cold callers and shysters looking to get rich quick. But when her attention is caught by a suspicious murder case, Drue finds herself entangled in a decades-old mystery - one that may have dire consequences for Drue and the people she loves. 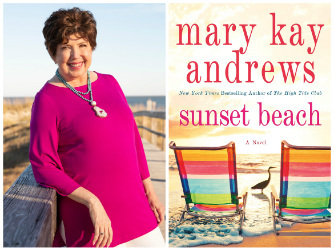 Mary Kay Andrews is the New York Times bestselling author of 24 novels including THE WEEKENDERS, BEACH TOWN, LADIES’ NIGHT, SUMMER RENTAL, DEEP DISH and HISSY FIT. A native of St. Petersburg, Florida, she received a B.A. in journalism from The University of Georgia and was a newspaper reporter for 14 years. After working as a reporter at newspapers including The Savannah Morning News, The Marietta Journal and The Atlanta Journal-Constitution, where she spent the final ten years of her career, she left journalism in 1991 to write fiction. Her first novel, EVERY CROOKED NANNY, was published in 1992 by HarperCollins Publishers. She went on to write ten critically acclaimed mysteries under her real name. In 2002, she assumed the pen name Mary Kay Andrews with the publication of SAVANNAH BLUES. In 2006, HISSY FIT became her first New York Times bestseller, followed by eleven more New York Times, USA Today and Publisher’s Weekly bestsellers. To date, her novels have been published in German, Italian, Polish, Slovenian, Hungarian, Dutch, Czech and Japanese.